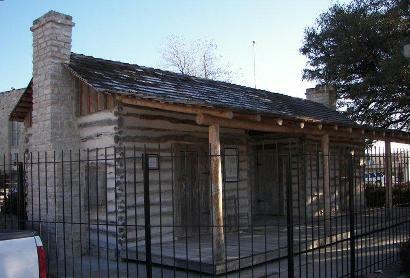 Comanche's Old Cora, dogtrot cabin, oldest standing courthouse in Texas. The 1936 Texas Centennial Marker near the city of Comanche says the county was thus named for those raiding warriors of the Plains because of their "superb horseman[ship]" and courage, as well as being "the terror of Texas frontier settlers who dispossessed them of their hunting grounds." With that in mind, we went to the county's 1856 courthouse as we looked in awe at a structure that has withstood time and the elements, as well as the best intentions of man. Although the citizens of Comanche County, created on January 25, 1856, had chosen the name of Troy for their county seat, they were affronted since there already was such a town in Texas. Local land agent Thomas Frost submitted several other names to the Postal Department, with the name "Cora" winning out. Cora was the name of the eldest daughter of Major Alonzo Beeman of Moffatt, Bell County, who must have been a good friend of Frost's at the time. Thus the county seat became Cora. 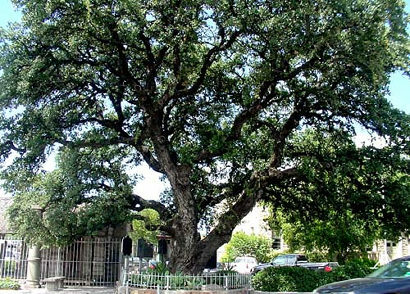 Right about this time in 1858, Martin Fleming, then a boy, enjoyed camping in a grove under the branches of a particular live oak tree. Fleming had previously befriended several young Comanches, but on this occasion, hundreds others, who had had it with encroaching settlers, were on the warpath. As the angry warriors sped in on horseback, Fleming hid behind this old oak, ultimately saving his life. In 1912, the grove was being destroyed as the city of Comanche took shape, but a much older Fleming put up a fight to save "his tree." His haven was spared and now stands as a place of honor on the courthouse square. 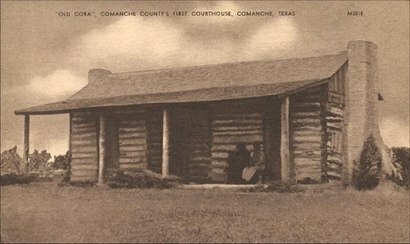 When the county seat was moved to Comanche in 1859, the Cora courthouse was developed into a two-roomed residence. Because of its historic significance, it was later bought and moved bit by bit to the municipal park at Lake Eanes where the Statue of Justice from the county's 1890 Victorian courthouse was also removed. 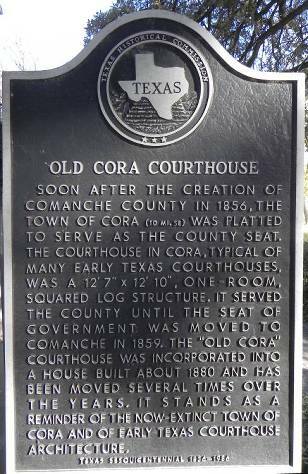 Eventually, Old Cora was moved to its present location on the southwest corner of the courthouse square right next to Fleming Oak. 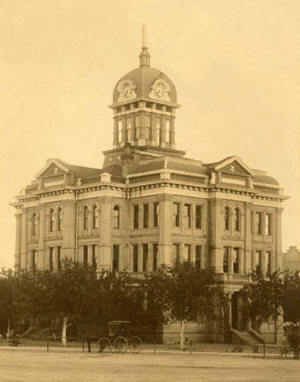 The outstanding 1890 courthouse, designed by Jacob Larmour, followed two other courthouses erected between 1859-1890. This palatial structure was three stories high. Atop its clock tower was the aforementioned Statue of Justice. The one-armed 1890 Statue of Justice. This Statue of Justice met with many unfortunate injustices. Once, in 1897, a proprietor of a local Comanche store demonstrated to onlookers the sharp shooting capabilities of his new shipment of rifles. He "stepped outside into the daylight for the benefit of his patrons" and was dared to " shoot the arm off the lady of Justice." Although the right arm of the law was made of 3-32"-thick lead alloy sheet metal, his shot was accurate. In 1908, her scale of Justice flew off during a storm. In later years, as the courthouse was being razed and she was taken down, workers noticed two bullet holes in her neck. That was not long before they discovered a colony of bees inside. The one-armed, scale-less lady can now be seen in the foyer of the 1940 courthouse. 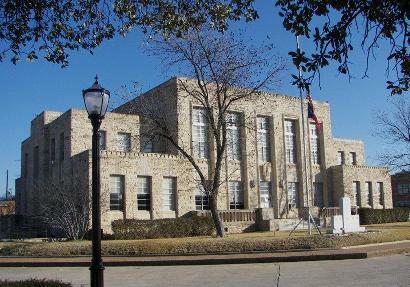 The 1940 courthouse, designed by Wyatt C. Hedrick, was built during the Works Progress Adminstration (WPA). This courthouse is built of native stone quarried out of Logan's Gap. 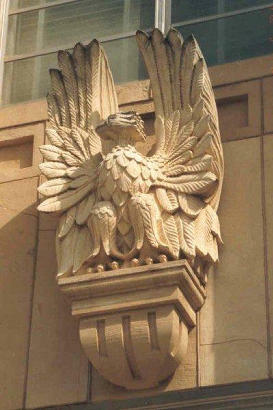 A pair of the most beautiful eagles adorns the entrances. Special thanks goes to one of our most favorite people, Margaret Waring, Comanche librarian and historian extraordinaire, for gracing us with her time and wisdom while we were there. She stands taller than any we've encountered.